A very common problem most of us face while browsing is unintentionally closing the tab. Sometimes while opening a tab or closing a specific tab, we end up closing the one tab we wanted to read. The moment this happens we regret and wonder how to re-open it. Well! To open closed tabs is not at all difficult by following step by step instructions as per the browser you are using all will be done. Plus, if you have closed the browser then also you can get all the closed tabs back. So, let’s get started and get our closed tabs back from all our browsers. As your Chrome browser is already opened place your cursor on new tab button. Now right click on it and select “Reopen closed tab” option it is second last in the list that opens. Alternatively, you can also use keyboard shortcut to open the closed tab. Now press Ctrl + Shift + T keys altogether. This will open the last closed tab to open others repeat the same procedure. Tap the menu button and then hit Recent tabs. This will open the last closed tab. This will open all the tabs that were closed as you exit the browser. This will open the last closed browser to open other closed repeat the same procedure. Tap on the address bar next hit the watch icon to get Recently Closed option. Now, click on the three lines at the top right of the window. In the context menu that opens, click on Restore Previous Session. As Safari is already opened click on History tab. Go to your already launched Safari browser. Now press Cmd + Shift + T keys altogether. Tap the Tabs button and long-press the + button to open list of Recently Closed Tabs. As Edge is already opened place your cursor on any open tab. Right click it to get the option Reopen closed tab. 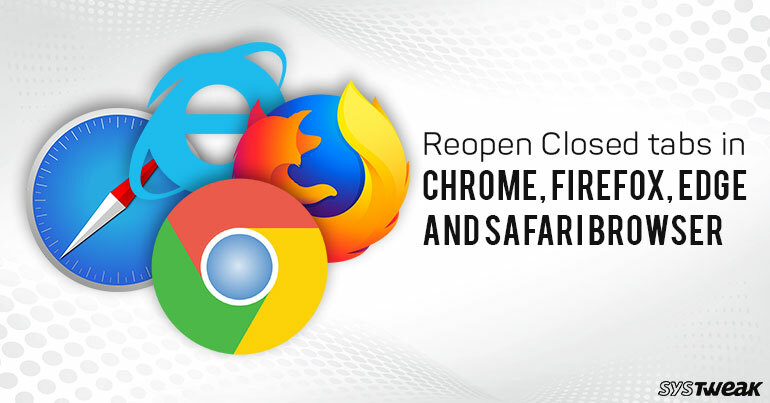 Using these simple steps, you can re-open the last closed tab. Please follow step by instructions don’t miss any step.